The two politicians exchange words again - after 13 years. 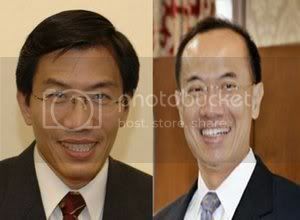 The last time Dr Chee Soon Juan crossed swords with Mr George Yeo was in 1996. The two had met at a Select Committee hearing specially convened to ascertain the Singapore Democratic Party’s assertions about healthcare costs in Singapore. Mr Yeo was then Minister for Health. 13 years on, the two men are again exchanging words – this time, in cyberspace. Mr Yeo suggested Dr Chee wrote to the People’s Action Party if he wanted a formal debate. To this, Dr Chee asked Mr Yeo to pass on his request for a debate to the PAP secretary general at its next Central Executive Committee meeting. He also said he would write to Mr Lee Hsien Loong separately. Mr Lee is the Prime Minister and also the secretary general of the PAP. Dr Chee, who addressed the minister by his name – “George” – then raised three concerns regarding ministerial salary, the Public Order Act and the operations of Temasek and the GIC. He also raised the issue of public assembly. He pointed out that “PAP supporters (are allowed) to hold processions and assemblies while supporters of the opposition are not.” Dr Chee also sought Mr Yeo’s opinon on Ho Ching’s continued tenure in Temasek despite her presiding over a $40 billion loss. Dr Chee said he was looking for Mr Yeo’s ‘thoughts and views, not those of (his) colleagues in Parliament’, instead of ‘non-answers’. In Mr Yeo’s third reply, he affirmed that he “fully associate … with the responses given by ministers in Parliament on salaries and the Public Order Act”. To this, Dr Chee lamented the “many Singaporeans currently taking on full-time jobs who are paid so poorly that they cannot pay their bills, send their children to school, or live decent lives”. He said that in light of the salaries that ministers draw, Singapore should “introduce Minimum Wage”. Dr Chee also asked about the disparity of treatment when the so-called Tak Boleh Tahan protestors were arrested, compared to the protests held by the Consumers Association of Singapore (Case). He also reiterated that Temasek and the GIC were not transparent, and that Temasek’s statement on Chip Goodyear’s resignation left much to be desired.